Igor Stravinsky memorably described Rachmaninov as ‘six-foot-six of Russian gloom’, and that description fits admirably, and at the same time magnificently, with this music. It arose out of Rachmaninov’s admiration for Tchaikovsky. For Tchaikovsky’s only Piano Trio, his Op. 50, had been dedicated ‘to the memory of a great artist’: Nikolai Rubinstein. Rachmaninov gave his Trio élégiaque of 1893 the same dedication; now the ‘great artist’ was Tchaikovsky himself. The young Rachmaninov was already making his mark on Russian musical life, as both prodigious pianist and talented composer. The dedication of the Trio is a reflection of the strong impression he had made on Tchaikovsky, the composer of the previous generation whom Rachmaninov most admired. The Trio is arguably the finest achievement of Rachmaninov’s earlier career: the period before his breakdown following the disastrous premiere of the First Symphony. It was preceded by another piece of the same name and for the same instrumental combination; but in every way, in both scale and conception, the earlier work is a pale imitation of the later. Naxos couple these two trios in a sensible combination that gives commercial value as well as artistic integrity. The performers seem ideal, and so too the recorded sound from that favourite venue for Naxos: Potton Hall in Suffolk. The Trio No. 1 is a work of sensitive emotion and admirable intellectual command, but the music lacks the vision and with it the truly epic commitment of the Op. 9 Trio of 1893. The latter is still an early work, and it is true that Rachmaninov returned to it fourteen years later to revise it in the light of a more sophisticated technique. Be that as it may, there is a complete integrity of design and an associated command of structure, and its every bar conveys an eloquent immediacy of emotion. Of course the performers need bring their own vision to chamber music that is built on such an ambitious scale. 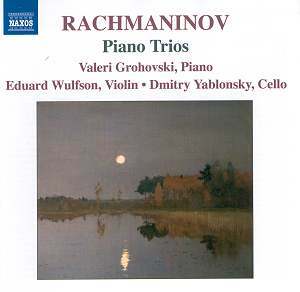 This Russian trio of Grohovski, Wulfson and Yablonski combine to achieve eloquence of line and intensity of expression, a performance that is founded upon techniques of the utmost assurance. Their interpretation is captured in an acoustic whose warmth serves the music well. Make no mistake; this is one of the most successful recordings of chamber music one could wish to encounter, and to have it available at budget price is a cause for celebration.